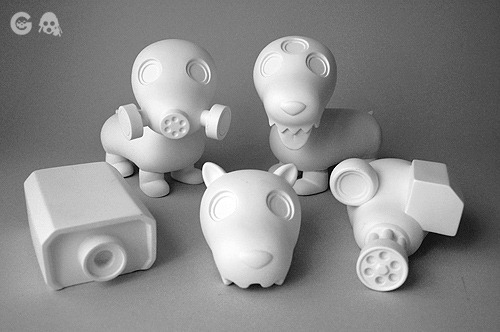 Today on Proto Monday, we’re happy to bring you a look at the wax prototype for 'Kookie No Good', a new 4" collaborative sofubi figure in production from Scott Tolleson and DeKorner. The wayward and mischievous fortune cookie concept began as a simple, fun idea from Kevin Cao of DeKorner back in December '12, who then asked Scott to create the character. As you can see, Scott did a nice job, lending Kookie just a hint of his signature geek style with the inclusion of the bow tie. 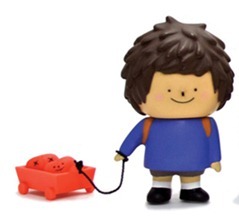 To complete the concept, each Kookie No Good figure will come with a misfortune inside the toy :) This fun figure is currently in production in Japan and should be released early in 2014. Happy Proto Monday. Today we’re bring you a 360 degree look (animated GIFs ftw!) 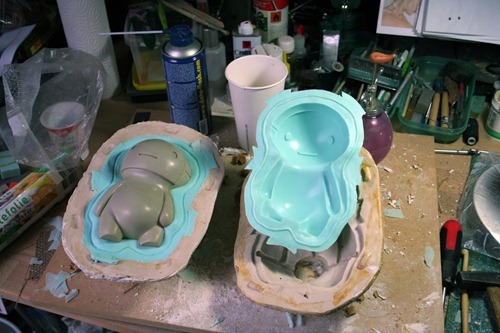 at the final sculpt for Buff Monster’s upcoming mini Ice Scream Dude (unofficial name) sofubi. 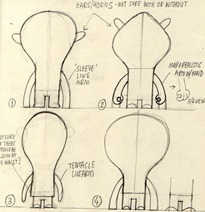 Buff’s work with NYC sculptor Kate Chilko to bring the lil’ dude to life began with his initial sketch. This detailed 3” figure has gone through a few revisions to get the character just right and also to ensure smooth production in Japan. 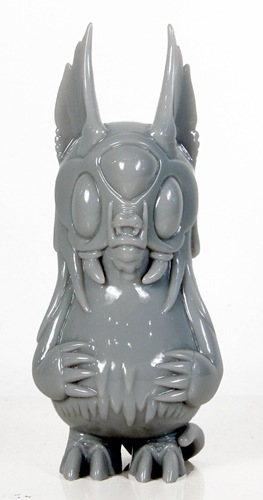 We’ll bring you more about Buff’s first self-produced sofubi as we get closer to the anticipated Summer release. Happy Proto Monday to you. Here’s an exclusive look back at the design and development of Pete Fowler’s inaugural art toy project with Dudebox – Pete Fowler and Fiends, which will debut at NYCC with two figures. Roughly a year ago, Pete sat down with Dudebox to brainstorm a new figure line that would be distinct from his previous efforts. Once the idea of a Fowler designed platform was agreed to, work began from Pete’s original drawings through 3D renders and 3D printed protos. During design and development, attention was paid to ensure that the figures were not top heavy and would balance properly and that the head, body, arms, and ears/horns accessories were interchangeable. In the end, a mix of rotocast and injection molding was chosen to achieve the desired playability goals. As you can see in these exclusive pictures, Pete designed a universal platform body and then created two separate characters – Dai and Owen, Welsh names reflecting Fowler’s homeland. Each character features his own individual head sculpt. Dai’s mustached egg-shaped cranium offers a nice contrast to Owen’s decidedly more bulbous head. As we previously posted, the first Dai figure, Dai Ocean, will be released at NYCC. Which leaves Owen’s debut to one of the ‘biggest names in vinyl toy culture’. Check the sneak after the jump. We’re looking forward to Owen’s full reveal, the NYCC drops, as well as the eventual release of the three winning designs from the ‘Design a Fiend’ contest. Today on Proto Monday we’re bringing you the first look at Creature Case, a user configurable character-based iPhone case created by Daniel Monahan, best known for his line of Angels and Gringos art toys. 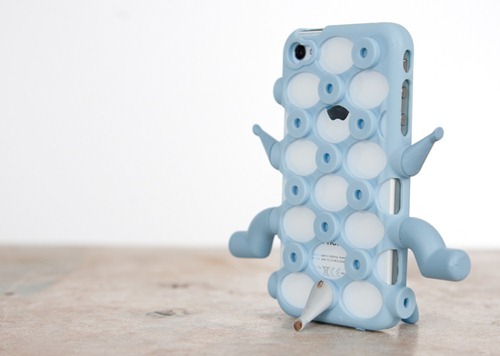 Instead of a static character design, the silicone Creature Case puts the owner in charge with a plug and play system using 9 PVC injected character parts which fit into 21 ‘nodes’ along the front, sides, and back of the case. Change the creature configuration to meet your mood – go big and plug all the parts in or streamline things with just a part or two. To complete the package, the Creature Case will release a iOS face-maker app for more build-your-own fun. To move from prototype to finished product, Daniel has created a Kickstarter campaign to fund the project. Several Creature Cases are available as rewards. In addition to any of the three standard colors (blue, pink and green) for $25, there are several special variations on offer including the Vinyl Pulse exclusive GID version and the Black Tie edition which is a two-pack featuring translucent white and black cases. Today on Proto Monday we’re happy to bring you an in-depth, behind-the-scenes look at Ajee’s new Kosplay 2-figure set due to drop in November from ExtendedPlayz. With Kosplay, Ajee continues her stylish use of hard, faceted edges in her sculpting, first seen in her Skullskin figure. 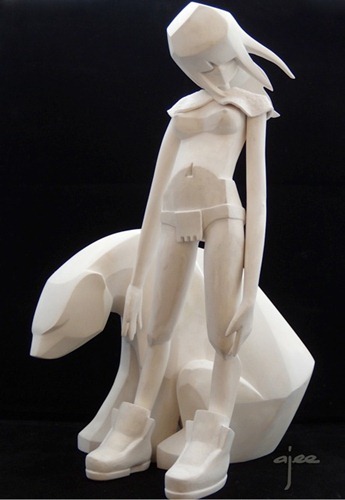 This time around she’s created a curious pairing, a female symbolically disguising herself as a skull and a polar bear disguised in Panda coloring (in part because Pandas receive more protection as endangered species). With Ajee’s character design and sculpting, Kosplay delivers a welcome angular look which stands out in a sea of me-too figures featuring bland, smoothly extruded simple 3D shapes. Courtesy of Ajee and ExtendedPlayz, today’s Proto Monday photo gallery is chock full of goodness including full shots of Ajee’s original clay sculpt of the figures, sketches, multiple design documents including pantone callouts, full photos of the debut black+white edition, the first look at the all-black edition, and the first indication of the GID edition which will feature three different glow colors. ExtendedPlayz will be showing Kosplay and their previously announced Cody figure (Proto Monday) at NYCC in the Trampt booth (#981). Ajee will make the trip from France and she’ll be bringing some exclusive goodies fresh from her workshop. Bonustoyz, ExtendedPlayz’s older sibling brand, will also be in effect at NYCC and should have some exclusive goodies as well. Jon Knox has had a hard time keeping this secret for some time now. Well, the cat is finally out of the bag, as he has revealed his newest upcoming vinyl figure, Cody. 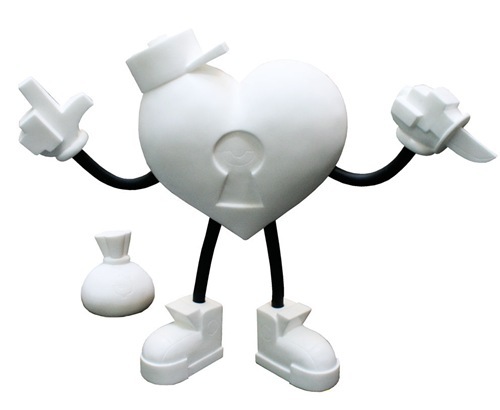 Under the art direction of Ajee, this 9” figure is produced by ExtendedPlayz, which is a branch of BonusToyz. One of the cool things about this figure are the moody magnetic eyes, which come with a pair of round shaped eyes and heart shaped eyes. Cody will be making an appearance at this years NYCC at the Trampt booth #981. We really feel that Ajee has captured the essence of Jon Knox’s resin characters in vinyl form and cannot wait to see the final product. Take a look after the jump of the photos of Cody in the works. It’s still Monday right? Phew. It is… at least on the West Coast. Here’s a last-minute, just squeaked in, right before SDCC edition of Proto Monday. Today we’re featuring an exclusive, detailed look at David Flores' (w/Hellfire) new 10” Deathead figure in production from Bic Plastics. If all goes according to plan, the figure will be on display at SDCC in the DKE booth (#4728). 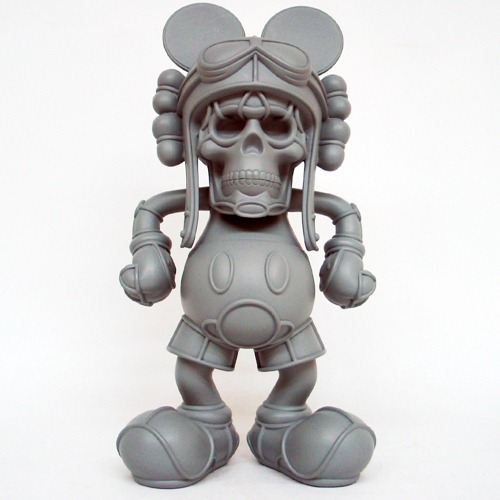 The figure blends the iconic mouse with the ‘Death’s Head’ symbol used by the Prussian army in the 19th century and then by several Nazi regiments during WWII. As you can see the sculpt is well-done with deep, pronounced lines carrying David’s signature stained-glass, segmented aesthetic while preserving the stark contrast between the two sets of source imagery. Until now, MAD’s upcoming Mork vinyl from Pobber has been lurking in the shadows, seen only in a few moody teaser shots. Today on Proto Monday we’re happy to reveal the mischievous figure complete with his improvised winged helmet fashioned from a handy dandy kitchen pot. Lurking after the jump, the complete gallery of master mold and wax shots showcase MAD’s ingenious design which embodies the story of a spunky suburban monster doing his best to channel his inner hero as he dons his makeshift hero outfit. Mork offers two personalities – intrepid with more than a touch of bravado with his helmet on contrasted with a more awkward vibe without his home-made head gear. Clothes supposedly make the man, and for Mork the gear is a big part of the story right down to the great hinge and handle details on the helmet. Due in the Fall, the 6.5” Mork will be shown to the public for the first @ SDCC as a work-in-progress prototype. We’re definitely looking forward to seeing more of Mork. Happy Proto Monday. It’s been awhile since we cast the spotlight on an exclusive proto reveal. We’re back with the intricately wicked Specimen #2 from Jason Limon in the works from newcomer Inner Sanctum. Specimens stem from Limon’s unfolding story about the rise of intelligent plant-based creatures which seek to re-establish a balance between nature and man, in part by co-opting the latter. As shown in his concept sketches (after the jump), each Specimen is delivered as pollen by airborne creatures, grows in the ground and then emerges intelligent, capable, and ready to reclaim the planet. The second in an series of seven art toys, #2 makes full use of the 3D medium. 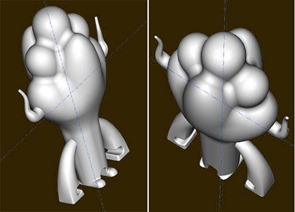 The detailed sculpt features six separate antennae-like projections, and six curved tentacles. Where Specimen #1 has a curved serpent-like body , the second intelligent plant has a more compact bulbous shape lending it an ominous appearance. Look for Specimen #1 from Inner Sanctum for Holiday 2011. It’s been awhile since we’ve brought you a Proto Monday, but today’s installment was definitely worth the wait. Today, we’re bringing you the very first look at LA artist Mari Inukai’s Sekaiseifukudan series featuring seven figures, dropping shortly from promising newcomer Inner Sanctum. Many of these characters have appeared in Mari’s oil paintings which blend traditional Japanese imagery with adorable whimsy. Sekaiseifukudan – which translates literally from Japanese as ‘world’ ‘conquer’ ‘team’, features seven characters who work together to conqueror the world through love. Each of the figures in the OG edition have a gleaming appearance stemming from their translucent hard plastic bodies and floating blue hearts – symbols of their search for complete fulfillment. Standing 6” tall on clear circular display bases, Mari’s figures are visually impressive, extremely well made, and give one the impression of luxurious art objects. For the toy geeks out there (us included), it’s definitely worth noting that the character’s hearts are suspended in each figure without any visible support of any kind. 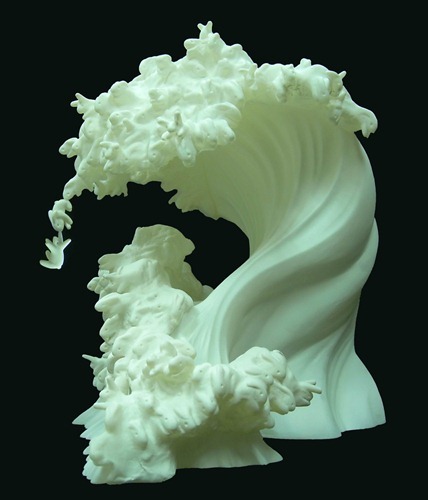 The use of a clear silicone to achieve this effect results in figures with solid heft. Now let’s get to know all seven characters which are based in part on Mari’s belief in Taoism. Fans of Mari’s art will immediately recognize the pair of hat wearing little devils– Akamarilla and Aomarilla, angry (red) and sad (blue) manifestations of Marilla, Mari’s alter-ego, who wears a hat similar to the one she wore daily as a student at Calarts. Discriminating collectors will note that each of the devils’ tails point in opposite directions, a visual reminder of their collective duality. Hone Marilla is the wide-eyed ghostly form of the character. Inspired by Mari’s daughter, Sena, the cat-like Nekomitaina is Sekaiseifukudan’s team conscience both in her normal and ghost, Hone Nekomitaina, forms. Rounding out the team is the rabbit-like Usagiman, the god of spring, renewal and growth and Obakeman who gives freedom to all he meets by absorbing their negativity into his form. Look for Sekaiseifukudan very shortly from Inner Sanctum, a company clearly focused on bringing artists’ creations to life as art toys. 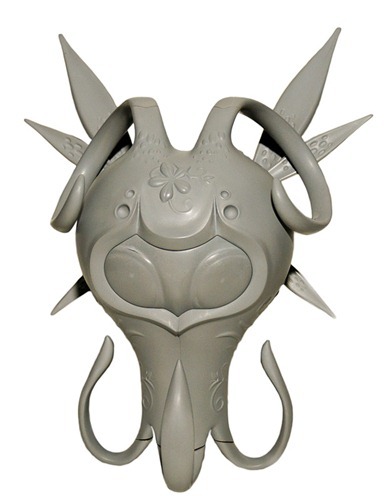 Today on Proto Monday we’re excited to reveal the first look at a proto of Camilla d’Errico’s upcoming Kuro vinyl figure in production from newcomer Inner Sanctum. Kuro, the evil yet adorable character from Camilla’s Tanpopo book series, has been released previously in plush both in 6” and 2’ forms but never vinyl. 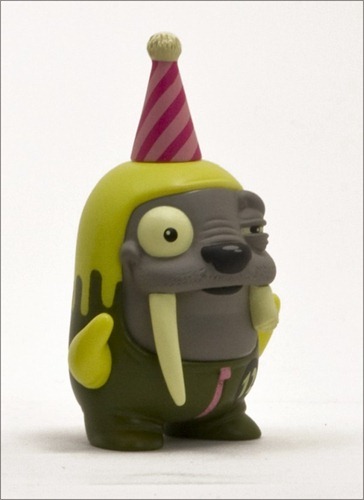 In fact, this will be Camilla’s first original vinyl figure. 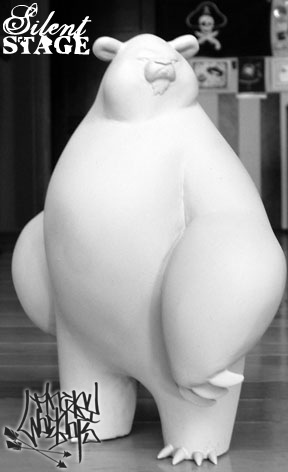 Shown here as a resin proto, the 6” limited-edition figure, sculpted by Daniel Ritthanondh, is due for release in the Spring of 2011 in a few different editions. He’s looking quite cute and seems to have made the jump rather nicely. If you’re attending NYCC (10.8-10.10), you’ll want to know that Camilla will be officially unveiling Kuro at the ‘Art to Merchandise – How to Make More with Your Art’ panel to be held at the ‘con on Friday October 8th 2010 from 12:15 to 1:15 PM in Panel Room 5 (1A17-18). Also, be sure to drop by her table (C11) in the Artist Alley starting on Friday @ 1 PM through the close of NYCC on Sunday (5 PM) for a nice selection of merch (books, prints, comics, and more) as well as a brand-new print. Today we’re happy to bring you a very special edition of Proto Monday featuring the first look at Yoskay Yamamoto’s upcoming figure from Munky King. Shown here as a work-in-progress prototype, the as-yet unnamed figure is based on his ‘Screaming for the Sunrise’ painting. Standing 6” tall, this mythical lion is incredibly detailed particularly with respect to the open mouth and the sculpted flames. While the sculpt looks great in the photo, it’s even more impressive in person – your gaze just locks in to the beauty of the piece. This new figure is an excellent follow-up to Yoskay’s smash-hit Koibito and may even surpass it in terms of raising expectations for art toys. 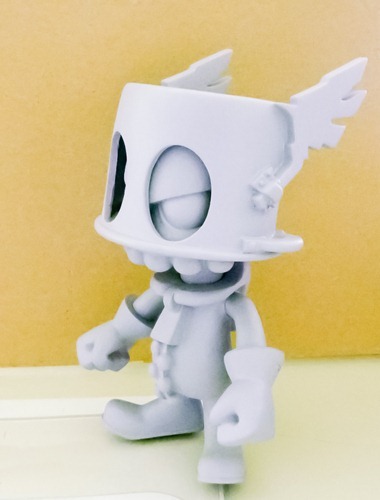 To accompany the display of the new figure’s prototype in their booth, Munky King will release a 6” x 8” Screaming for the Sunrise print (150 pcs). Happy Proto Monday. Today we’re brining you a first look at the wax stage of the elephant from Scribe’s upcoming Resound Field Guide mini series from Cardboard Spaceship. 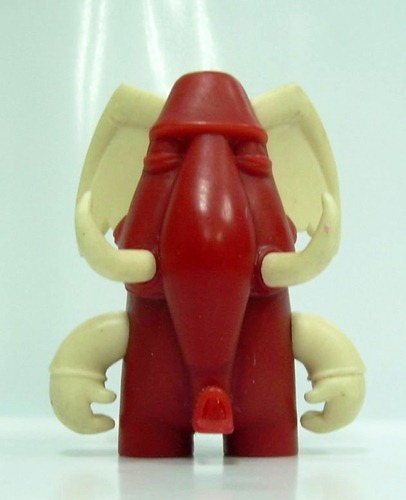 One of seven total figures, the elephant really leverages the 3D medium well with the large ears, tusks, and snout. Stay tuned for painted shots. The Resound Field Guide will drop at SDCC in Cardboard Spaceship’s booth (#4534). It’s been almost exactly three months (Proto Monday) since we brought you the very first pictures of Scribe’s Walrus, one of several figures in the upcoming Resound Field Guide mini-series from Cardboard Spaceship. For today’s Proto Monday, we’re happy to bring you a return lookwith these closeup shots of a painted Walrus prototype. This olive green jumpsuit with yellow splatter design is the standard colorway. There’s also a yet to be revealed chase colorway. Very humorous figure -- love the 'surprised' expression with the one wide-open eye. The wait for Scribe’s OG minis is almost over – The Resound Field guide is expected to drop this summer. Today on Proto Monday we’re bringing you the first look at a test shot of Kozyndan’s Uprisings vinyl currently in production by Munky King. Based on the duo’s classic Uprisings image, the upcoming vinyl follows the extremely-limited resin edition which dropped late last year. 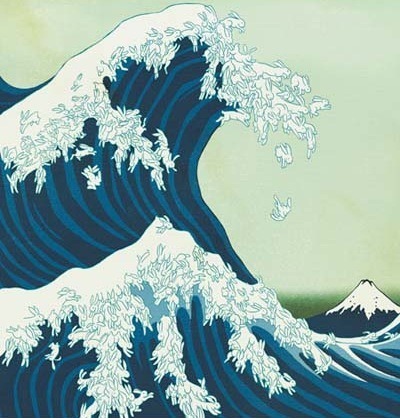 This new edition has a few notable tweaks including the addition of two addition bunnies at the front of the wave crest which gives the piece a more dynamic visual impact. More art vinyl sculpture, than toy or figure, the new Uprisings should appeal to Kozyndan fans as well as those looking for a display piece that will fill the art object desire. Today on Proto Monday we’re bringing you the very first look at the sculpt for BittaCritta, Scott Tolleson’s first original vinyl. Scott has made his name with a string of alternative material OG toys including the Tricycle Terror and Big Rollin’ Rascal resin figures as well as the wood Doc Von Block. Now, he’s taking the plunge by self-producing this grumpy lil’ one in a horned lizard suit. Standing 6” tall, BittaCritta has plenty of personality – the snarled expression, the horn (not your typical symmetrical job, but bent back at an interesting angle), the eyes on the side of the costume, and the hefty tail. BittaCritta has 3 points of articulation (neck and shoulders) and is slated for three colorways. With a strong design, we’re looking forward to the arrival of Scott Tolleson’s self-produced baddie. Happy Proto Monday. 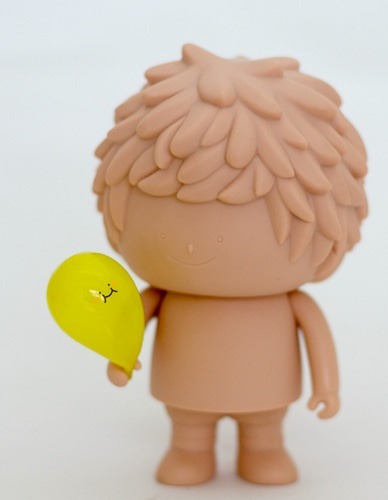 Today we’re bringing you the first exclusive look at the initial sculpts for Bubi Au Yeung’s Treeson and Other Stories Series 2 due this summer from Crazy Label. The follow-up to last year’s first blind-boxed mini series features Three Baby Treeson figures including a cute seated version. Adding to the story and the world, we also see new characters including Mushroom and a pack of amicable Stars. Expect the final production figures to vary slightly from what you see here. Be sure to click the photo above for a larger view. Treeson fans, this one’s for you. Today on Proto Monday we’re bringing you an exclusive first look at the sculpt for the upcoming 5” version of Bubi Au Yeung’s Ren, Treeson’s human friend, from Crazy Label. Ren was originally featured (below) in the Treeson & Other Stories minis released last summer. Due for a stand-alone release this summer, the larger Ren features a more detailed sculpt which includes articulated arms. The inclusion of a bubble-funs in the above sculpt photo suggests that Ren will follow Treeson’s (8”) fondness of the bubble-funs. 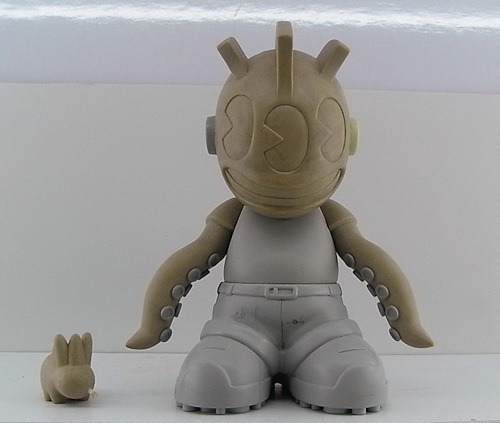 Today on Proto Monday we’re bringing you exclusive shots of the unpainted clay sculpt of the upcoming Kidrobot 18: Kidmutant figure by Frank Kozik. Up until now the elusive three-eyed Kidmutant has been only seen briefly in video-cap shots. Here he is front and center along with a mini mutant labbit (three ears, six legs). Kidmutant sports two tentacles (arms) and is as far as we know the first Kidrobot figure that does not have the sculpted-in watch on the wrist. Today on Proto Monday we have some sweet images for you. Here’s the first look at vinyl prototypes of Ferg’s latest addition to the SQUADT universe – the upcoming K11 companions from Jamungo. As you can see here, the K11s look sharp with different removable helmets featuring designs carrying the SQUADT DNA with the trio of eyes (clear lenses), gas-mask, and the tell-tale wagging tongue. Nice variety – the CCTV one caught us pleasantly by surprise. The medium-sized K11 figure (5” long, 4” tall) will come geared up with backpacks and other cut and sew gear much like the SQUADTs. If things go as planned and the toy gods smile upon K11, we should see the first drop sometime this spring. We’re excited for these – a nice addition to the very cool SQUADT universe. Happy Proto Monday. We've got something special for you this morning. We've been waiting awhile for an original Angry Woebots figure. Not for much longer! 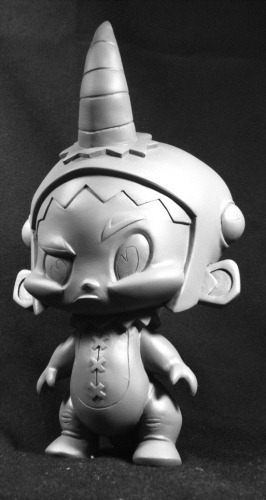 Here's the very first look at the upcoming Panda King resin by Angry Woebots and Silent Stage in unpainted proto form. The impending release is the culmination of a journey that began when Silent Stage laid eyes on Angry Woebots's sketch from '04. Shown here without his crown, this beastly Panda stands 8+" tall and is just as wide at the elbows -- he's a big 'un. Silent Stage will show the Panda King proto at DesignerCon this Saturday, November 21st @ the Pasadena Convention Center with an online release shortly after. 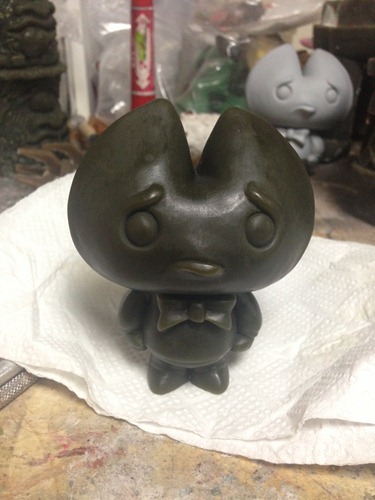 With a bit of luck, the Panda King proto will be shown fully painted in all of its regal glory. Limited to 60 pieces, the first edition will be hand-painted by Angry Woebots and come with a mini print in a custom box. Happy Proto Monday to you. After a weekend full of treats, we’ve got one more for you. 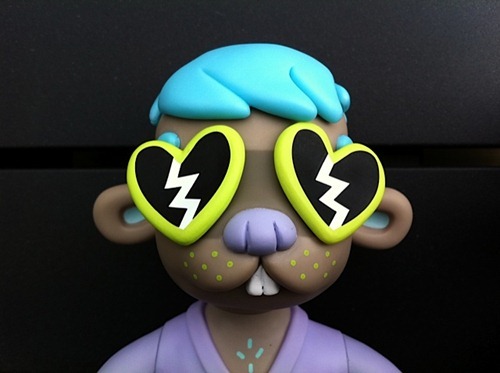 Here’s the very first look at a prototype of MINDstyle’s McChina (10”) by Ron English. With an eye towards his first major solo exhibition in Beijing, Ron has transformed his ever popular and critical look at an indelible fast food icon. Clad in retro Chinese military fatigues, McChina considers the evolving role of a new China by juxtapozing the past with contemporary commercial realities. 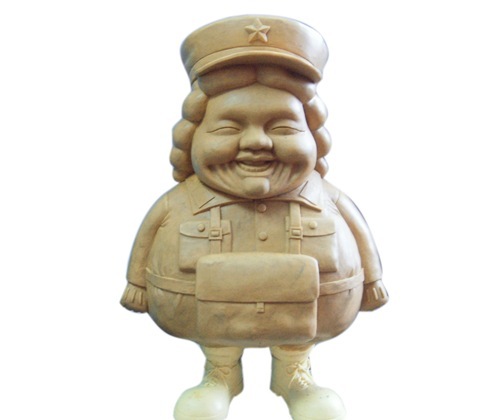 Awash in a multiplicity of meanings, this figure will serve as “MC” / official mascot for Ron’s Popaganda Pop Up shop as part of the Fall 2010 Beijing show. The Master of Popaganda continues to impress and provoke critical thought. Today on Proto Monday, we’re happy to bring you the first complete look at Brent Nolasco’s first original figure, Gordo, dropping shortly as a 5” limited-edition resin from mphlabs. This portly beastie is a strong translation of Brent’s art to 3D with nicely rendered details. If you’re familiar with Brent’s work, you’ll recognize Gordo as his creation right away. Congratulations to Brent on his long-awaited and much deserved first opportunity at a production toy. More news on Gordo shortly. Proto Monday >> Three x Argonaut Resins – Stick Up! Today on Proto Monday we have a first look at the final unpainted proto of “Stick Up!”, a new limited edition resin project by Three of Gold Coin and Argonaut Resins. Drawn from Three’s Tee design for GC clothing, Stick Up! features a first for Argonaut Resins – bendable limbs. Interesting approach for articulation with low-run resin. Look for info on the first wave of Stick Up! resins shortly. Happy Monday. It’s been a while since we’ve heard from Cameron Tiede, so we’re stoked to bring you an advanced look on Proto Monday at his newest project – an intricate flower figure. This project is 100% Cameron’s art and work – from conception to production to painting, a truly rare occurrence. Enjoy this first look at the petal part of the figure and stay tuned for more. This one to wait for and save for.